Dolphin, or mahimahi, love to hide under weedlines and ambush their prey. 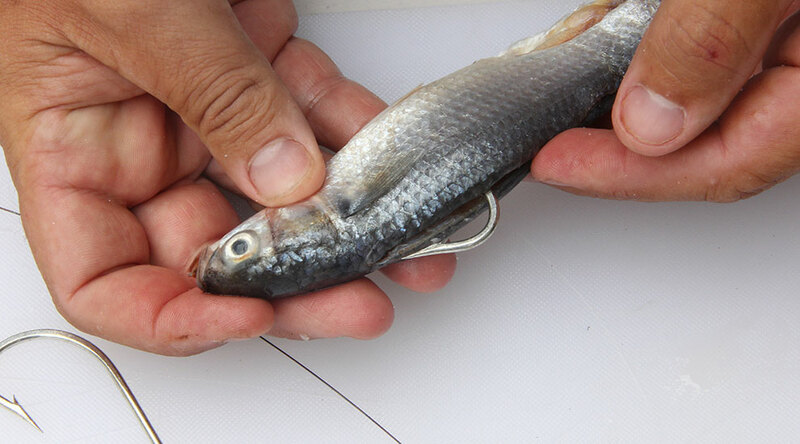 This swimming mullet is the perfect bait for fishing along the weeds. It swims just like the real thing and runs weedless so you don't have to worry about shaking grass off of your baits all day. Just focus on putting fish in the box! By Michael Murray. The ideal mullet should be a bit larger than the typical "finger mullet." A four-inch bait is the perfect size. 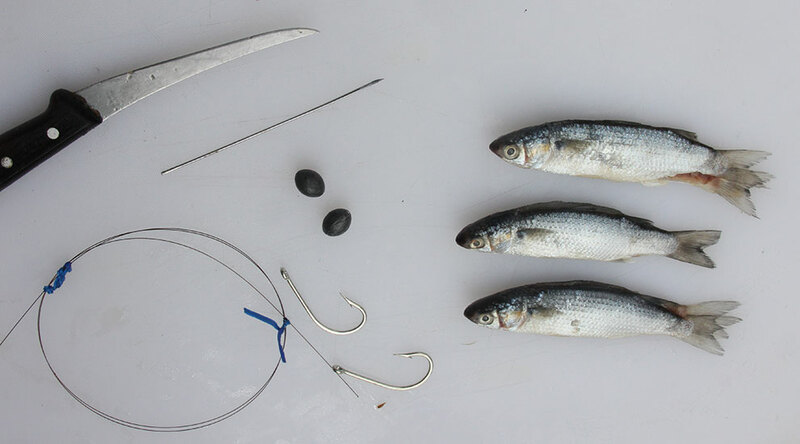 To rig the bait, you will need a one-half to one-ounce chin weight, a 7/0 J-hook, a rigging needle, a sharp knife and leader material. For leader, you can use 60- to 80-pound fluorocarbon or #7 wire. Dolphin don't mind the wire, and it will help avoid cut offs from wahoo and other members of the razor gang. The mullet are netted during the annual run off of Florida and frozen. 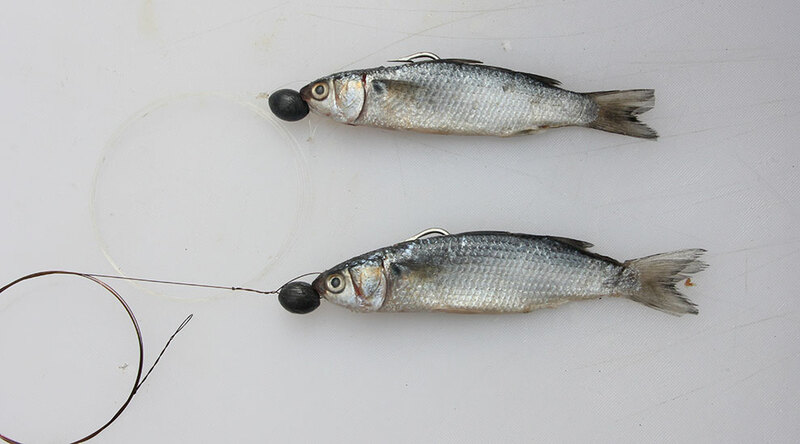 Before freezing the mullet, each bait is deboned, and split-tailed. They are then salted and vacuum bagged for storing. 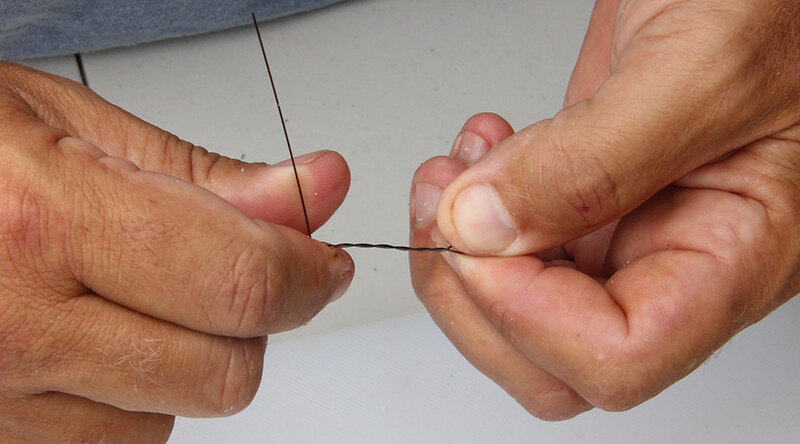 To rig up the swimming mullet on wire, begin by making a loop with a haywire twist at one end. This loop will act as the connection point to the main line. 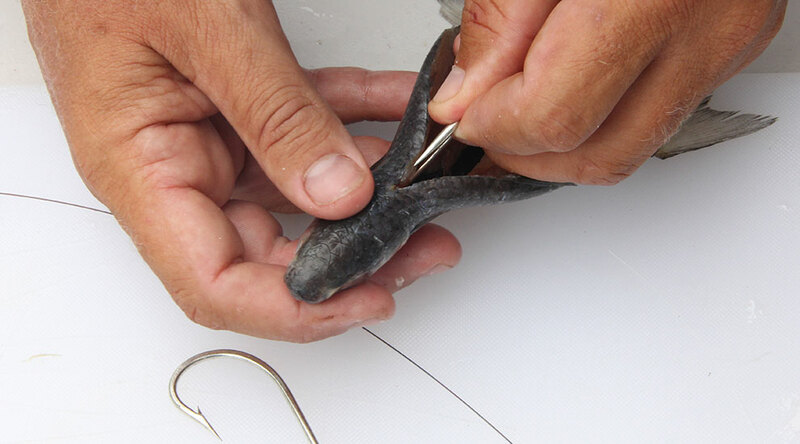 Place the hook inside the bait with the point riding up, by the bait's back. 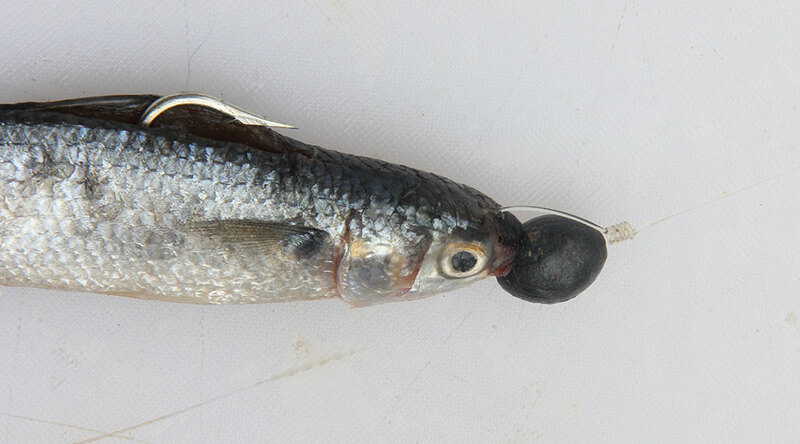 The eye of the hook should sit in the bait's mouth. 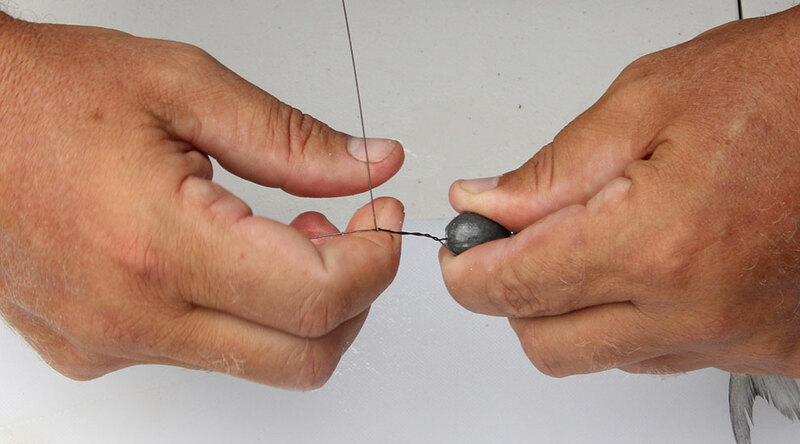 Adjust the hook so it fits perfectly inside of the bait with the point of the hook riding along the top of the bait. The hook point will sit just inside of the bait when running. This makes it very streamlined and "weedless." 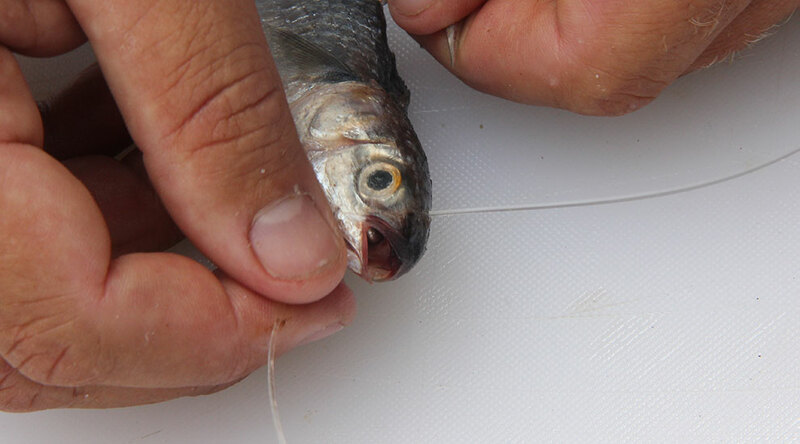 Using a rigging needle, make a hole through the center of the mullet's head, through the eye of the hook and out the bottom of the jaw. 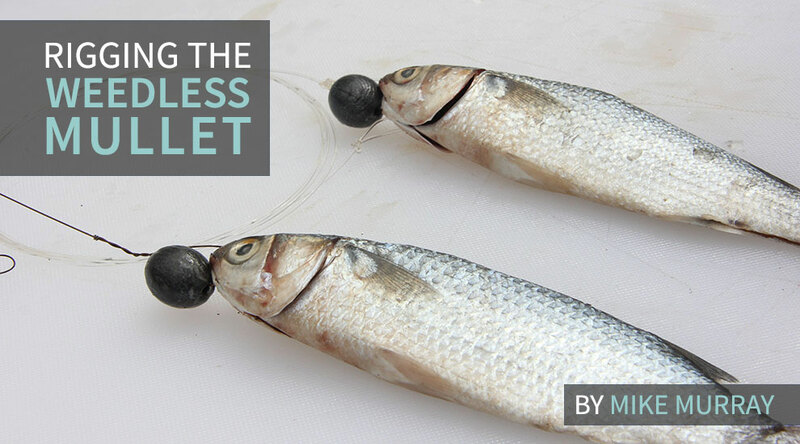 You want to make sure to the hole is in the center of the bait's head so the finished bait swims perfectly. If the hole is not dead center, the bait may spin. Place the wire through the hole you created with the rigging needle, making sure to get the wire through the eye of the hook. 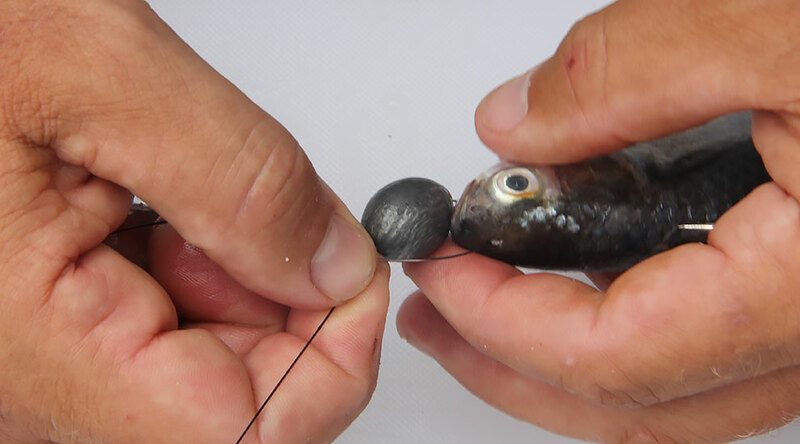 After you pull the wire through the bottom of the bait, double check the eye of the hook to make sure it's held in place with the wire. You don't want to lose a fish because you missed the eye of the hook with the leader. 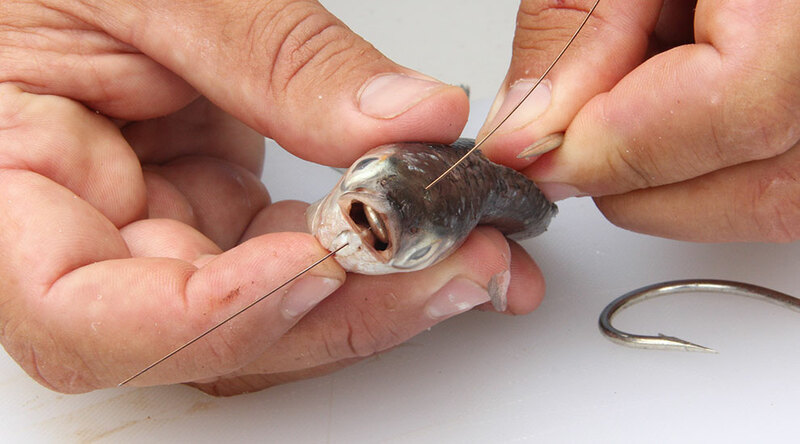 Slide the chin weight into place, making sure to leave a little bit of room so the bait can swim freely. If you cinch the weight down too tight, the bait won't swim properly. Use a haywire twist to secure the chin weight in place. When removing the tag end of the wire, get as close to the twist as possible. You may want to give the tag end a pinch with a pair of pliers as well to make sure it's flush. If you leave a tag end sticking off, that tag end can catch on weeds. The finished rig. 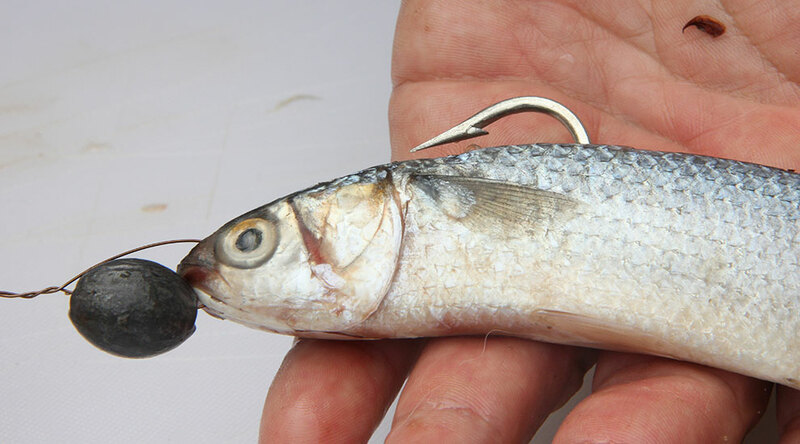 Before setting the swimming mullet out behind the boat, place the point of the hook just inside the bait. This way it won't catch on any weeds, but will come tight when a dolphin or wahoo grabs hold. 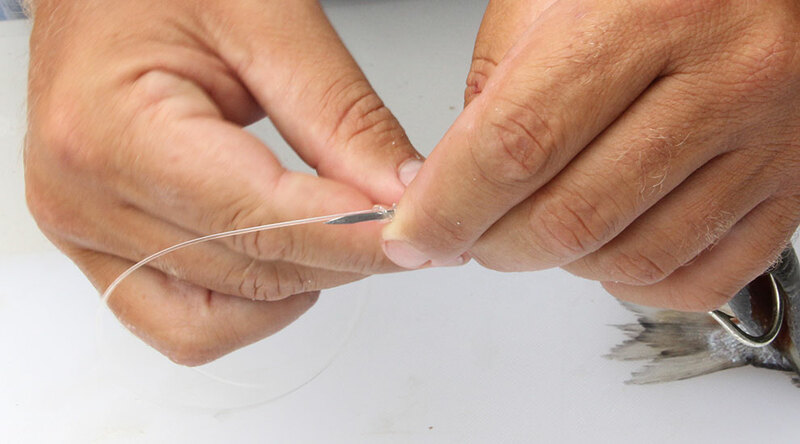 To rig the weedless mullet on mono or fluorocarbon, start by tying a perfection loop at one end of the leader. This will be you connection point to the running line. You can also use a barrel swivel, or make a loop with a crimp and chafing gear. 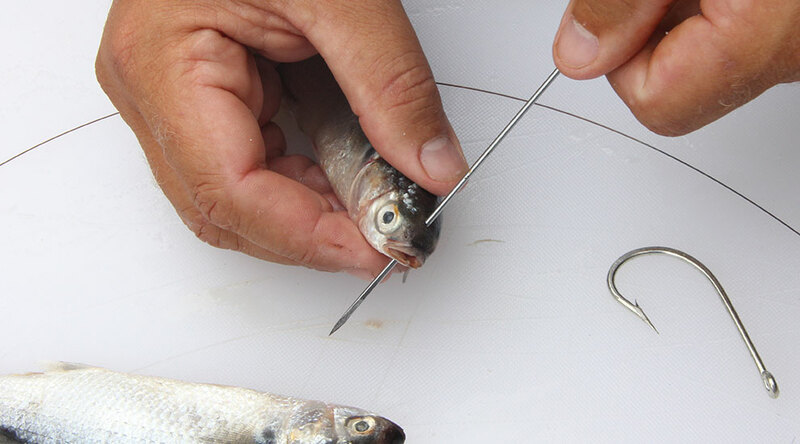 Just like the wire rig, use a needle to make a hole in the center of the bait's head, running through the eye of the hook and out through the bottom of the jaw. Then run the leader through the head, making sure the fluoro goes through the eye of the hook before exiting out the bottom of the bait. 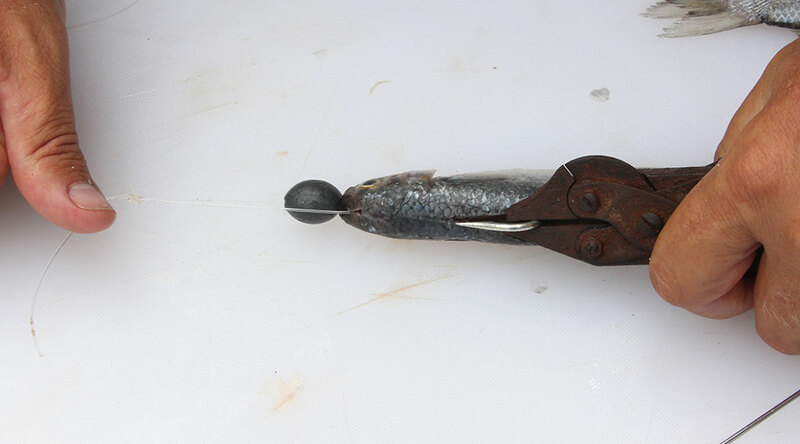 Slide on a chin weight down the leader and tie a nail knot using the rigging needle to secure the weight into place. A uni-knot will also work in a pinch. Pull the knot tight against the chin weight, but don't cinch it down so tightly that it affects the swimming movement of the mullet. Cut the tag end as close as possible to keep the tag from snagging on grass. The finished bait is a dolphin slayer. You can fish this swimming mullet along weeds without worrying about cleaning off grass all day. 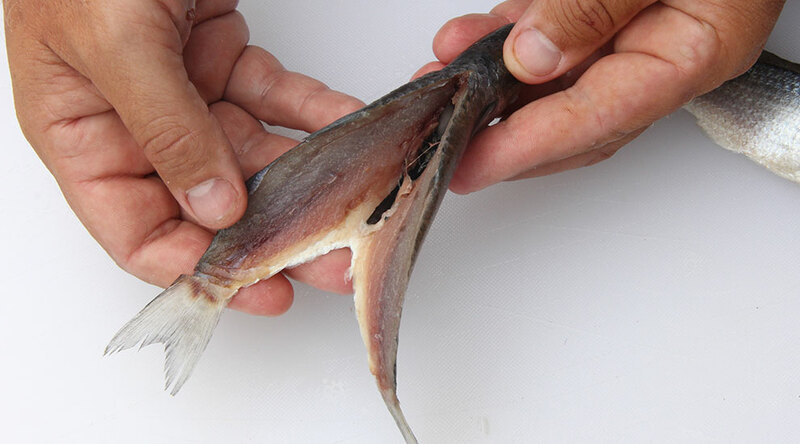 Dolphin fish cannot resist the weedless, swimming mullet. Make sure you have plenty of ice in the fish box when you pull this bait. You're going to need it to ice down your catch!